This past week Chuck the rooster died. I don’t think my neighbors will feel too sad because, if that rooster was anything it was a loud talker. I called it talking and everyone else called it crowing. But, to me he seemed like he had something to say and anyway I am going to miss him and his point of view. Why would I write a eulogy for a silly bird? It should go something like, “Chuck kept the hens together, crowed lots, and then he died.” Surely a rooster isn’t worth more words of praise than that. 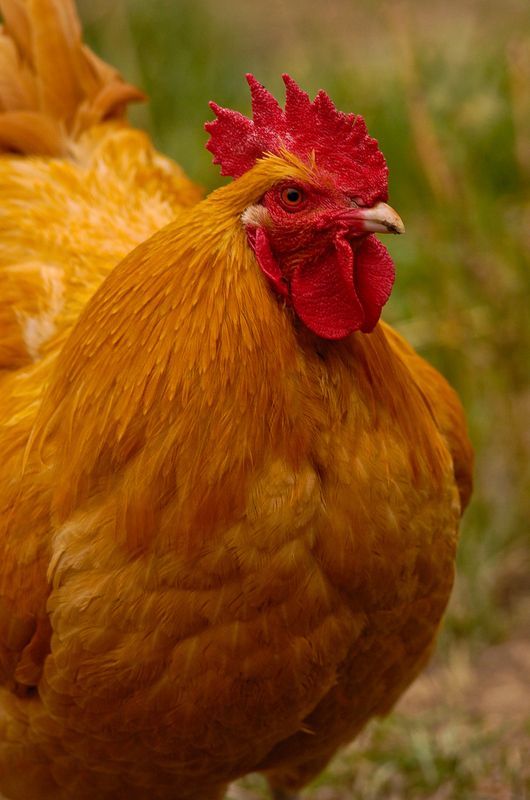 He had a good pedigree; he was a Buff Orpington rooster with striking colouring and handsome spurs. In May I wrote an article titled “Pets make Great Photography Models”. In that I wrote, “Got a new camera or lens? Want to try out that studio lighting technique? Or just bored and want someone ever ready and able to pose for a photograph? Call the dog, or coax the cat. I can’t even begin to count the pictures I have taken of the horses, dogs, cats, parakeets, hamsters, chickens, fish, and frogs I have taken in my life”. Those pets never complained when the pictures didn’t work out, and even waited for another blast of the flash without blinking. And I continued saying that Chuck, my rooster that guards the hens, doesn’t seem too interested in standing still for his portrait. So, other than not having Chuck to keep a bunch of chickens on the straight and narrow, I’ll miss having an ever ready, constantly moving subject to practice my photography on. That rooster never stood still for long. He was always guarding, herding, searching for interesting stuff on the ground, then telling us all about what he found, flapping a lot and was always running around. Sometimes I would set the lenses I wanted to try out on the rickety old wooden picnic table that sits in the back meadow and then open the gate to the chicken pen so Chuck and the girls could get out. They always want to get out, and eyeing my wife’s flower garden would clumsily run out and across the unmowed field grass with Chuck guarding the perimeter like some soldier on patrol. I would sit, crouch, and lay in the tall grass, making exposure after exposure until they trundled past and into the overhanging bushes of the garden. In retrospect I should have been more serious about the pictures I took, and now I wish I had kept more of that silly old bird. But I seem to only have one or two stashed on my hard-drive. Anyway, who wants a picture of a chicken hanging on their wall? I tested cameras, lenses, flashes, and my ability to light with flash outdoors, stop movement and focus properly on quick moving subjects. I would walk out in the yard, find Chuck and the chickens, try something out, dump the images from my memory card to the computer, check them out, make a decision about what I wanted to try next, then delete them and go out and start again. I couldn’t have thought of a better photographic test subject. Yep, that rooster never stopped moving and I am going to miss our time together. This entry was posted in Photography and tagged Buff Orpington, cameras, chickens, Eulogy, flash outdoors, flashes, focus, lenses, models, photographic test subject, photography, portrait, quick moving subjects., Rooster, stop movement. Bookmark the permalink. Camera Manual and the Basics of Photography. I almost miss him after reading that descriptive eulogy. We used to have a rooster farm across the creek from our house, so I would never have thought about missing a rooster, but you described him well. Love it! Ya, he was a good and I suppose, willing subject. Thanks so much for your comments. Thanks for that…and as I commented, a good story.